Dragon fruit is known for its unique appearance and vibrant colors, but few today are aware of this fruit's exact benefits. Dragon fruit, named rightly for how it looks, is native to Central and South America. Although it was largely unpopular until the turn of the 21st century, dragon fruit is steadily sweeping across North America. On and off the table, it provides both nutritional and medicinal benefits. Helping stabilize blood sugar. Dragon fruit has been shown to improve glucose metabolism, keeping blood sugar levels steady in people with hyperglycemia and diabetes. Decreasing cholesterol levels. Dragon fruit provides a healthy amount of monounsaturated fats, which helps reduce harmful cholesterol (LDL) and promotes cardiovascular health. Strengthening immunity. This fruit is rich in vitamin C, which strengthens the immune system by enhancing white blood cell activity in order to fight infections. Moreover, since the fruit is composed of 80% water, it is low in calories, which helps with weight control. Aside from normalizing bowel movements to promote gastrointestinal health, foods high in fiber can help regulate diabetes by keeping blood sugar levels even. Since fiber is indigestible, it prevents the body from producing too much insulin. Excess insulin blocks the use of stored glucose and prevents the body from making glucose from non-carbohydrate foods. This can lead to daily fluctuation in glucose levels. 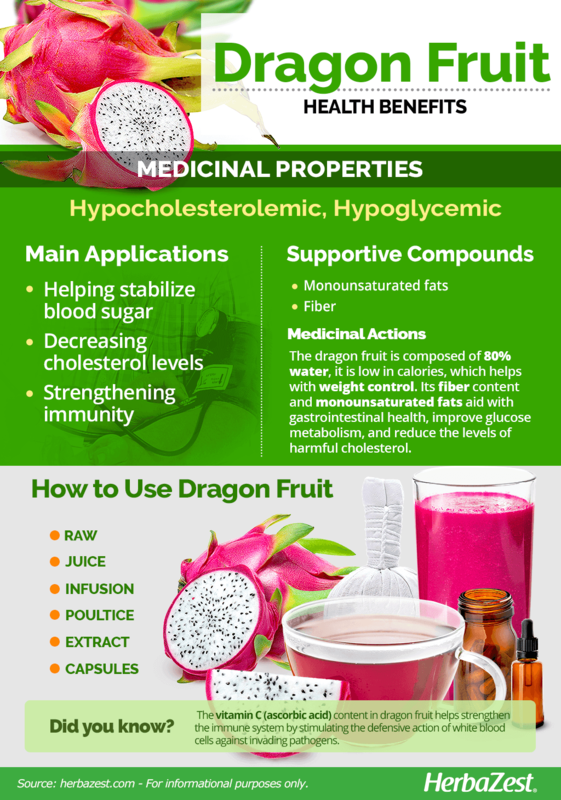 Dragon fruit also provides consumers a healthy amount of monounsaturated fats, which help decrease bad cholesterol (LDL) levels and increase good cholesterol (HDL) levels. LDL cholesterol forms plaque within arteries, making them less flexible. Heart attacks or strokes happen when a clot forms in a blocked artery. HDL cholesterol assists in removing LDL cholesterol from the arteries by carrying it to the liver. In the liver, LDL cholesterol is broken down and excreted from the body, thus promoting cardiovascular health. Hypoglycemic properties can also be found in cinnamon and rhubarb, while olive and coffee are examples of herbs that can benefit cardiovascular health. When consumed in moderation, dragon fruit has no known serious side effects. However, eating excessive amounts may lead to diarrhea because of the fruit's laxative properties. Overconsumption may also lead to a harmless, reddish hue in the urine or feces, which is referred to as pseudohematuria. It is most likely safe for everyone to consume dragon fruit in normal portion sizes; however, it is not recommended to consume dragon fruit in an attempt to cure any ongoing ailments or diseases. Although there is no research disapproving consumption of dragon fruit for a specific group of people, it is recommended to eat a balanced diet that includes five daily servings of fruits and vegetables. Dragon fruit's nutritional value includes good amounts of vitamin C (ascorbic acid), a water-soluble nutrient, crucial for proper iron absorption and essential for normal body function. Because it is not stored in the body, it must be obtained daily from one's diet. Vitamin C helps strengthen the immune system by stimulating the defensive action of white blood cells against invading pathogens. While 2,000 - 3,000 daily milligrams of vitamin C can effectively protect the immune system, the intake of just 500 milligrams of vitamin C also increases the body's production and blood levels of glutathione, an antioxidant that detoxifies bacterial waste products and has some beneficial influence on the immune system. Additionally, dragon fruit provides small quantities of minerals, mainly iron, phosphorus and calcium, as wells as vitamins B2 (rivoflavin) and B3 (niacin). 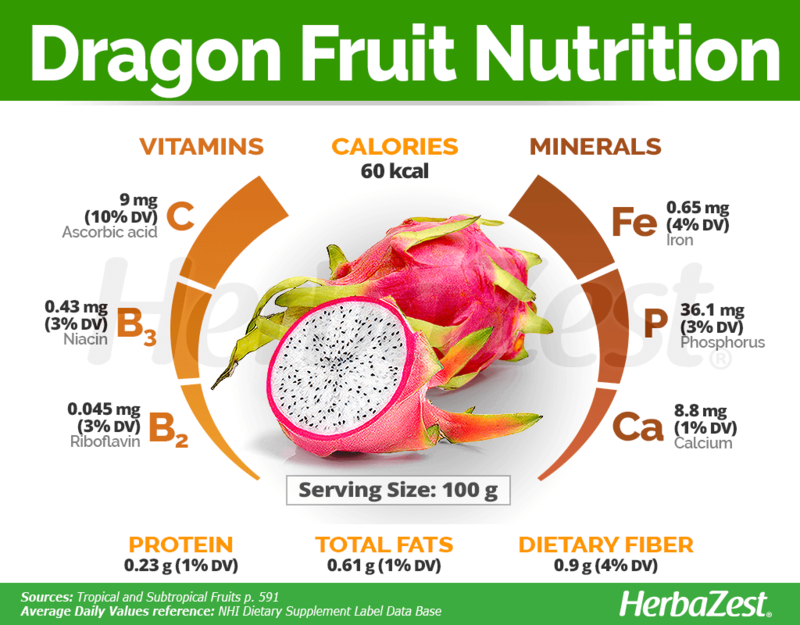 100 grams of dragon fruit provide 60 calories and 4% of the daily value for dietary fiber. Whether eaten or used medicinally, there are many ways to enjoy dragon fruit. A myriad of processed dragon fruit products are derived from the fresh or frozen fruit pulp, including jelly, syrup, ice cream, pastries, yogurt, fruit bars, energy bars, and more. Dragon fruit flower buds can be used for making soups or salads. Raw. 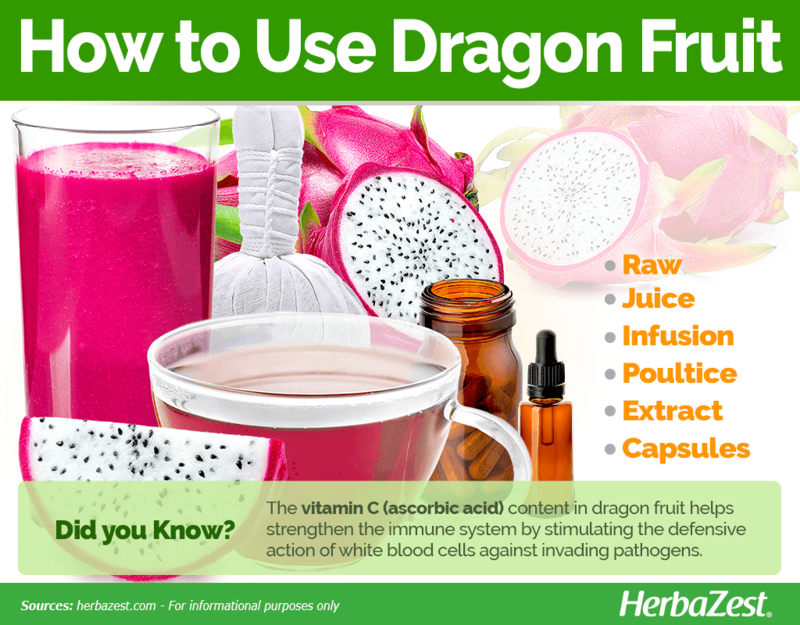 This is the most common way to consume dragon fruit to reap its many health benefits. Consider refrigerating the fruit beforehand, and avoid eating the skin. It is safe to eat the seeds. Juice. This fruit's juice is good for treating colored hair and maintaining healthy skin due to its high vitamin content. When mixed with cucumber and honey, dragon fruit is believed to soothe sunburned skin due to its high B-complex content. Infusion. Some consumers choose to use the buds of the fruit for making an antioxidant-rich tea. Poultice. The sap of the plant is believed to help treat wounds when applied topically. Liquid extract. The antioxidant properties of this extract are thought to be useful for wound healing, as well as for soothing and moisturizing the skin. Capsules. These extract capsules boast the same health benefits as eating the fruit itself, including providing the consumer with extra vitamin C to help against inflammation. Dragon fruit in North America can be found in specialty stores and farmers' markets mainly during the summer, from June through September, with August and September being the peak months for most fresh varieties. 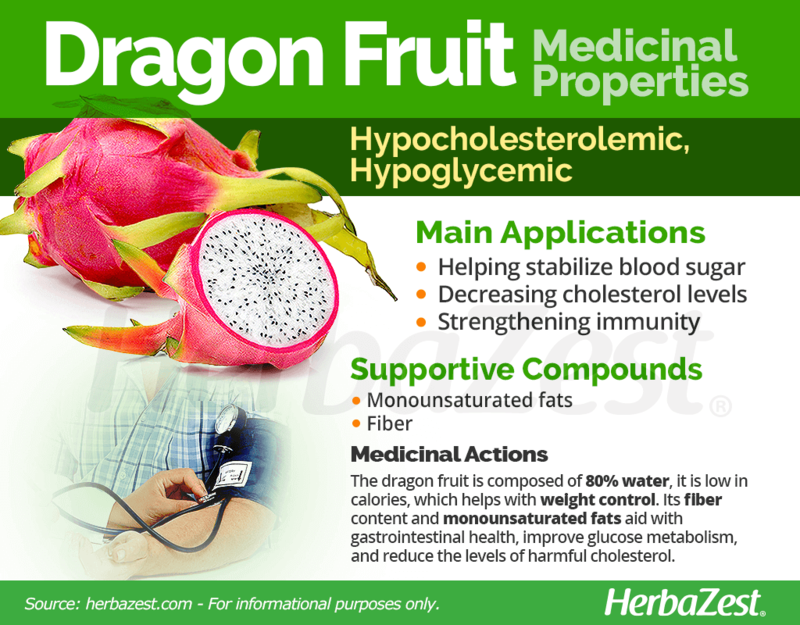 Dragon fruit remedies and supplements can be found year-round in specialized health stores, as well as through online retailers, along with other dragon fruit products, such as fruit bars, jelly, juice and more. Dragon fruits mainly grow in tropical and subtropical regions, including parts of Asia and Latin America. The best climate for dragon fruit is in a warm, moist climate. The area should not exceed 102°F (38°C) or have intense sunlight. Dragon fruit is a climbing cactus plant that grows best in rich, organic soil. It requires between 25 - 50 inches (64 - 127 cm) of annual rainfall; excessive amounts may contribute to flower drop and fruit rot. Dragon fruit plants need to be irrigated twice a week. This cactus requires either natural or artificial supports or fences to grow up. The normal flowering and production stage of dragon fruit is from June to October. The dragon fruits can be harvested 30 - 50 days after fruit set. The fruit will continue to grow until harvested with no noticeable change in sugar content. The skin colors can change from green to red or rosy-pink. Dragon fruit is propagated by cuttings that are prepared from an entire stem segment or six to eight inches (15 - 20 cm) stem segments. There are few diseases known to affect dragon fruit. However, stem rot caused by Xanthomonas campestris and brown spots caused by Dothiorella on the fruit have been reported in Australia and Central America. Detailed information about growing dragon fruit can be found in the herb garden section. Dragon fruits are oval-shaped and about the size of a baseball or softball. They have a yellow or red peel with green scales. The texture of the flesh of dragon fruit can be compared to a watermelon or kiwi, and it is believed that the cultivars with pink flesh are more flavorful. All dragon fruit have seeds that are similar to the size of kiwi seeds. The name of the genus derives from the Greek words hyle, meaning 'woodland', and cereus, the name of a large genus of the cactus family. The combination of both refers to the occupation of wooded lands by cacti. There are about 16 species of Hylocereus, all native to Central and northern South America. However, the two main varieties of dragon fruit grown for production are H. undatus, which has bright pink skin and white flesh, and H. costaricensis, which also has bright pink skin, but varying hues of pink flesh. Another variety of dragon fruit, also commercially cultivated, is H. megalanthus, with yellow skin and white flesh. The dragon fruit is native to Central America, where it is generally known as a pitahaya in Mexico and pitaya roja in the rest of Central and northern South America. According to Aztec literature, pitahaya fruits where consumed as far back as the 13th century. It is believed that the French brought the fruit to Vietnam, where it is now grown extensively, from Nicaragua and Colombia. Others claim it came from South American Guyana around 1870. Dragon fruit is thought to be native to Mexico as well as Central and South America. However, there are many other countries outside of North and South America that commercially produce the fruit, including Vietnam, Thailand, Malaysia, and Israel. The United States imports the majority of its white-fleshed fruit from Southeast Asia, mainly Vietnam. Acreage of dragon fruit within the United States is growing but still limited. California is the primary producer, followed by Florida and Hawaii. The demand for this newly-emerging crop is currently higher than the supply, creating a possible opportunity for more commercial farms to open up nationwide. 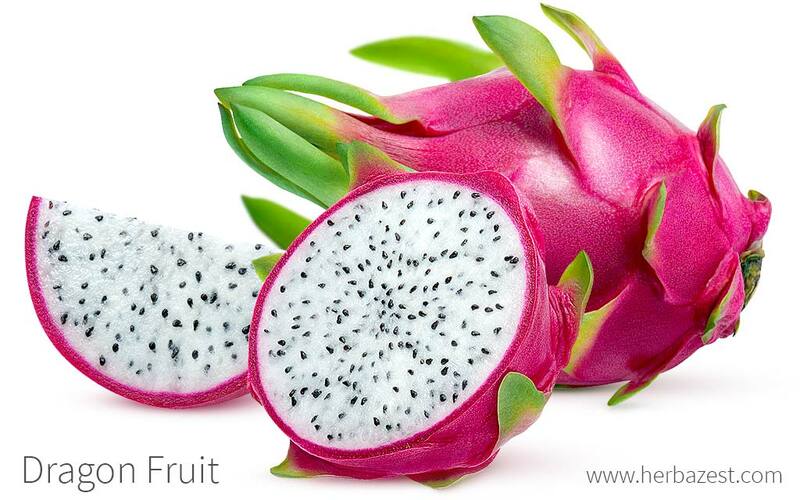 Dragon fruit can be used for anti-aging facial masks due to its high amount of antioxidants. A paste is made out of the fruit with yogurt. After letting the paste settle on the face for 20 minutes, it can be washed off with lukewarm water. Making a straight paste from the fruit flesh helps treat acne. Dragon fruit has been gaining popularity throughout the past couple decades for more than just its unique appearance. This fruit helps build up immunity and lower bad cholesterol levels among other functions. Since it is present as a main ingredient in more than just food products, consumers can find it year round or attempt to produce it themselves under the right growing conditions.